Glutinous Rice | Jasmine Food Corporation Sdn. Bhd. Jasmine’s glutinous rice or pulut as it is called locally, is of a high quality grade that is popularly used for making snack delicacies. A must-have item during festive celebrations. 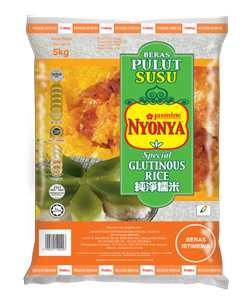 Glutinous rice as a category under Specialty Rice, is identifiable by the orange band at the bottom of the pack.